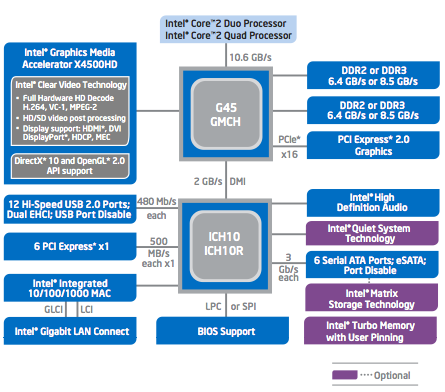 Computex Intel yesterday formally launched its G45 and G43 integrated chipsets, part of the 'Eaglelake' family. But you'll only get full Blu-ray Disc support with the first of the two, it admitted. Not a first, of course. The chip giant was quick to tout how the integrated parts were the first chipsets it had made that incorporates full Blu-ray content playback on the built-in GPU, Intel's GMA X4500HD. However, it later admitted that the G43 doesn't. Its GPU is the pared-back GMA X4500 - note the lack of an 'HD' suffix. Still, both support DirectX 10 and, like fellow Eaglelake chipsets, the P45 and P43, can control a single graphics card in a PCI Express 2.0 x16 slot. Unlike the P45, neither the G45 nor the G43 can also host two x8 PCIe 2.0 slots. Both chipsets can support output through HDMI, DVI and DisplayPort connections, with HDCP copy protection where appropriate. In addition to DX10, they'll also support OpenGL 2.0... when Intel ships a driver update in Q3. The integrated parts hook up to Intel ICH10 and ICH10R southbridges - the latter adds support for RAID 0, 1, 5 and 10. Both chips provide six 3Gb/s SATA ports, a eSATA link and 12 USB ports. They have on-board HD audio and Gigabit Ethernet. Any or all of the USB and SATA ports can be disabled. The northbridges support frontside bus speeds of up to 1333MHz and DDR 3 memory clocked at up to 1066MHz. But while the G45 has two channels and two Dimm slots, the G43 has but one.